Gerard L. Tonies, of Belleville, IL, born on January 3, 1927 in East St. Louis, IL, died on Sunday, March 24, 2019 at Dammert Geriatric Center. Gerard was a graduate of Central Catholic High School. He entered ROTC at University of Illinois in 1944 and was a Lieutenant in the Army. He served his country in Europe during post WWII operations and as an officer in the Korean War. Gerard was a graduate of Washington University. His work experience included being a real estate appraiser for the state of Illinois for 20 years. He also worked at Illini Savings and Loan as an Appraiser. 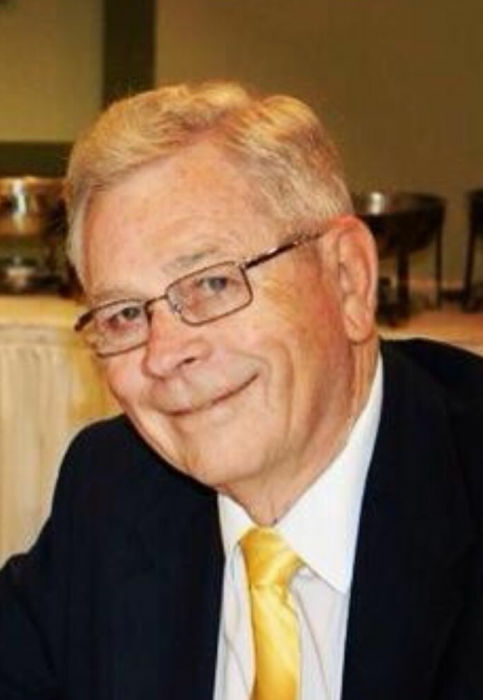 Gerard was a former president of the Society of Real Estate Appraisers and a former member of the Serra Club. He married Audrey Maxine Newman on September 5, 1949 and they were looking forward to celebrating 70 years together this year. Gerard was a devout Catholic family man. His joy in life came from his wife and family. He also enjoyed playing in weekly card games throughout the years. He most recently started a Saturday night poker club at Esquiline. Gerard was preceded in death by his parents, Gerard B. and Evelyn, nee Vermeersch, Tonies; his brother Paul Tonies; granddaughter Colleen Nesbit; daughter-in-law, Nancy Tonies, brother-in-law, Joe Burroughs. Gerard is survived and will be greatly missed by his wife of 69 years, Audrey Maxine Tonies, nee Newman; his children, Catherine (Timothy) Nesbit of Swansea, IL, Gerard J. Tonies of Appleton, WI, Diane (Richard) Deichmann of Wentzville, MO, Ronald (Denise) Tonies of Perrysburg, OH, and Craig (Linda) Tonies of Carlisle, MA; 17 grandchildren, 30 great-grandchildren; and 2 great-great-grandchildren; his sister Mary Anne Burroughs of O’Fallon, IL; and his sister-in-law, Merce Tonies of Poynette, WI. Gerard leaves many nieces, nephews and friends. Memorials may be made to Colleen Nesbit Memorial Foundation. The family would like to express their gratitude to the caregivers of Dammert Geriatric Center and all the kind people at the Shrine of Our Lady of the Snows. Visitation will be held on Wednesday, March 27, 2019 from 6:00 p.m. to 8:00 pm. At the Shrine Apartment Community Chapel, Belleville, IL. Funeral Mass of Christian Burial will be held on Thursday, March 28, 2019 at 11:15 a.m. at the Shrine of Our Lady of the Snows Apartment Community Chapel, Belleville, IL with Fr. Joe Ferraioli officiating. Interment will be held in Mt. Carmel Cemetery, Belleville, IL.